In most tea shops around England toasted Yorkshire teacakes can be found on the menu. There is a big difference between hand made ones and mass produced. A little like processed bread the mass produced teacake once toasted and spread with butter becomes a doughy nothingness, whereas the hand made version is more robust with a much better flavour and texture. These large 6” sweet bread buns are studded with currants and are delicious split and toasted with butter. Traditionally accompanied by a cup of tea. I prefer to replace the currants with sultanas but any dried fruit can be used. Someone from Yorkshire might have a problem with that, as they are quite protective of their regional recipe but I am a great believer in cooking what you like and how you like. Fresh yeast is difficult enough to find locally let alone in the centre of London. I would have a better chance of obtaining class A drugs than finding an ounce of fresh yeast on my local high street. Supermarkets used to offer fresh yeast for free from their bakery section but this seems to have stopped. I have on many occasions in the past bought fresh yeast from my local baker – what always amused me was when I asked for it the shop assistant would have to go into the actual bakery to get it and when she returned the baker himself would appear to give me the once over! I don’t know whether he was in fear that I might be setting up a rival bakery or the notion that a customer had dared to actually have a go at yeast bakery themselves. Alas this source has also now dried up. Which forced me to search on the internet. I found I could buy fresh yeast online from suppliers of flour but the minimum order premium just didn’t make ordering 100 grams of yeast viable. The answer in the end turned out to be Ebay. Which is where I found Paul of Online-bakery. He offers a brilliant service – order it on a weekday and it arrives through the door the next day. For me fresh yeast gives a better flavour and is always worth the effort of sourcing. As soon as the yeast came through my letterbox this weekend, it was straight into the kitchen where I started on the list of yeast recipes I have been itching to make. Starting with Yorkshire teacakes. This recipe will make six large teacakes. It is not compulsory to eat them all in one sitting as they freeze very well. The best way is to split them and then freeze them. This way they defrost all the quicker and are ready to pop under the grill for whenever there is a yearning for a toasted teacake and a cup of tea. Place flour and salt into a bowl and rub in the butter. Being lazy I use a small food processor. I put a small quantity of the flour in with the butter, whiz to create a breadcrumb effect and then add to the rest of the flour in the bowl. Add the sugar and sultanas (or currants). Stir the yeast with the warm milk until blended, add to the flour mixture. Mix to a firm dough and knead for about 10 minutes. The dough should be smooth and elastic. Cover and leave to rise until double in size in a warm place. Lightly flour the work surface, knead again and divide into 6 equal sized pieces. I weigh the entire dough and then divide the number by six. Roll into balls, flatten with the palm of your hand and put onto greased baking trays. I find I need two trays – three Yorkshire teacakes to each. Brush tops with milk. Cover and leave to rise until almost double in size. The teacakes should be golden brown when ready. If the Yorkshire teacakes don’t slide off straight away leave on the baking tray for five minutes and then remove, the extra time tends to help them to unstick. Thank you Stefano. Who would have thought Ebay! My local baker won’t sell yeast anymore. It seems that to source actual ingredients is getting harder and harder. 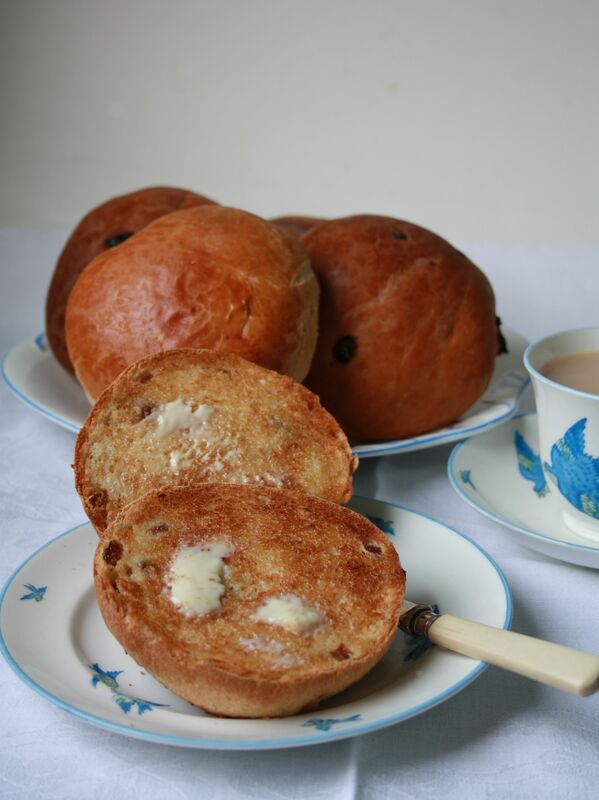 These look lovely Maria – teacakes are dear to my Yorkshire heart! Thank you. There is something rather comforting about them always makes me think of times gone by. I’d not heard of using fresh yeast before, Maria, but then again, I’m not much of a bread baker. Still, when I read that you found some on E-bay, I went searching to see where I might find some here. Not only did I find a source but I discovered a bread bakers group here in Chicago. Not only that, but there’s a nearby bakery that is reputed to have the best bread in the City. So, this was a personally rewarding post. I now know how to make a delicious tea cake, where to get fresh yeast & a loaf of bread, and a group to join if I feel like doing more baking. I am glad you have learnt something from my post, I am continuing to learn from yours! In fact we are having Bartolini Sausage Ravioli for dinner today (3rd time of making). 8 am and I am thinking that as soon as I have drank my coffee I shall be making the pasta! 3rd time!?!?! I can’t tell you how pleased I am to learn that you’re making one of our recipes — repeatedly. It really is an honor, Maria. Thank you. Actually John its going to be one of our favourites. Everyone loves it. I made it for a special lunch yesterday and my daughter has taken your recipe away with her. What was also nice was that it wasn’t just any recipe it had a story. I told them about you, about your mother, Zia, Max so now when Sophia makes it she will associate it you. Maybe, that’s why I love food so much! So thank you for sharing. I’m not even sure what fresh yeast is, having always bought the little pre-measured packages, but now I’m curious as to what effect this would have on taste and temperament of the teacakes and other baked products. Love the dark golden color of the tea cakes. Thank you Kathleen, for me fresh yeast makes all the difference. I do have to confess a little on the dark golden colour, I was also making brioche so as to not waste the egg wash I used it on the Yorkshire teacakes, hence the colour! Maria, I have a great admiration for you…baking your own bread! It looks delicious. On a different subject: have you ever thought about adding a follow button to your blog? I prefer it over the one that appears by default in the bar at the top of your blog because if you add it I get an email whenever you publish a post, which I find it handy. Thank goodness otherwise I wouldn’t know how to fix it! Thank you for sharing this super recipe with us. You are so right about home-baked cakes compared with the commercial variety, but just occasionally, that extra special establishment crops up, like a ray of sunshine on a cloudy day, or a beautiful shell on a sandy beach, and it restores your faith that all is not just tat and grunge. I agree with you totally Maureen trouble is we seem to be more and more accepting of the tat and grunge as being the normal. Fantastic……best recipe ever tried. I also made some with mixed fruit and a level teaspoon of cinnamon. …perfect..then made 9 plain buns for burgers….once again perfect..this recipe is going in my notebook.. So pleased you liked the recipe. Its lovely to get feedback. I have used this recipe for a very long time and I am always pleased with the results. Never thought of using them for burger buns – will try that, thank you.